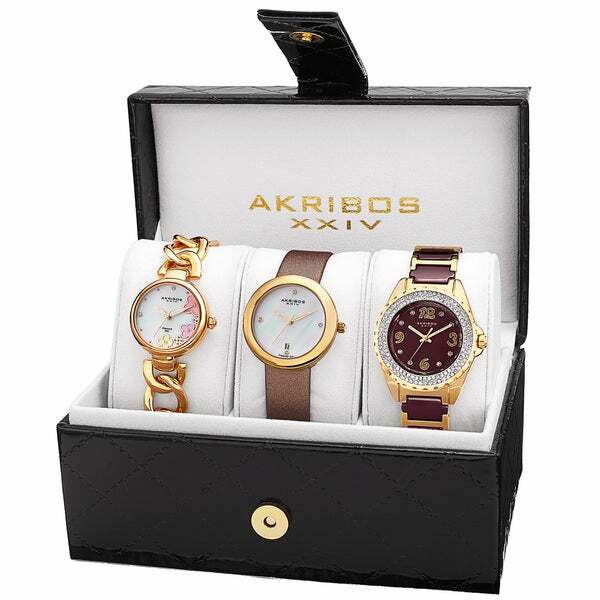 This ladies Akribos XXIV elegant watch set is sure to impress. The themed set includes genuine diamond markers, crystal accents, mother of pearl dial and many more incredible features. This set is sure to make any women happy. I got the silver set. I'm glad I got these on sale. The watch with the bling is completely gaudy. I will never wear it. The bangle one with the flowers is my favorite. The one with the white strap is ok but the strap looks cheap. There is no way the retail price that is shown is real. The nicest thing is the box they came in. Will make a nice small jewelry box. They weren't worth paying for the return so I am keeping. Would never recommend. This trio of watches came to me "helter skelter" disarranged in their box, one had the tab pulled and the watch was going. Aside from the fact that some may like the watches, I found them to be rather ugly. The promised rose gold metal looked like tarnished copper and was very mottley. I intended to send them back, but got lost in my work and couldn't figure out how to go about sending them back. To this day, they remain untouched in their wretched black quilted plastic box. Be advised...make sure you like them before purchasing! Love all of these and great price! I love all of these watches and think I may buy a set in the other color because they were such a fantastic price. This was one beautiful set. I purchased this as one of my wife’s Christmas gifts and it was definitely worth it at extremely reasonable price.when I opened the box before wrapping all of the watches were perfectly in place and the Rose Tone was dazzling. She has started wearing the chain link watch along with her bangles I love it as much as she loves it. One of my better purchases. Great watch set for anybody to buy. This person I bought this set for loved it! Great product. Nice watch set. My wife really loves all three. Set looks very nice. Different styles to wear. Good price for this set. Great value for three beautiful watches. I love this brand of watch and they never let me down. All three of these watches are well made and show stoppers when you ware them. Stylish but finish faded very quickly and watch batteries died very quickly as well. Overall the price reflected quality. My wife really like her watches. My mom was very excited when I gave her these watches for her birthday. Love these watches. Perfect for any occassion. I wear one just for work any they are so functional. I really enjoy changing my look everyday. Pretty in picture but quality is so so. This was a really great deal! I already gave them to my wife since she intercepted them off the porch and she really loved them! This was the perfect gift for the woman with everything! it will give her a variety of styles to mix and match with what she is wearing. Looking for a stylish watch to attend a wedding. I could not pass up the savings and I had O Rewards to spend! Love it! Couldn'tske up my mind do went for the best deal. Also these watches were small proper,+sized women's watches. I have very small wrists. "does this come the way it is shown 3 set"
This set includes three timepieces.